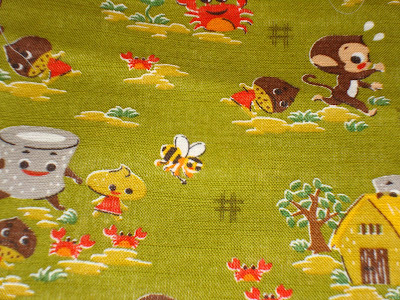 Fabric Friday today shows several fabrics that have nothing to do with each other, hence Random FF. These fat quarters have random words and logos on them. 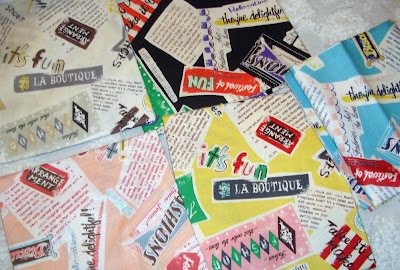 I do like fabric with words, letters and numbers. I don't know that I have met many novelty fabrics I didn't like. What isn't to like about hedge hogs and daisies? I don't know what I'll use this for but I only have a fat quarter. I'll think of something sometime. Now that I think about it, I'm pretty sure I've shown this fat quarter before on a Friday, but in a different color. 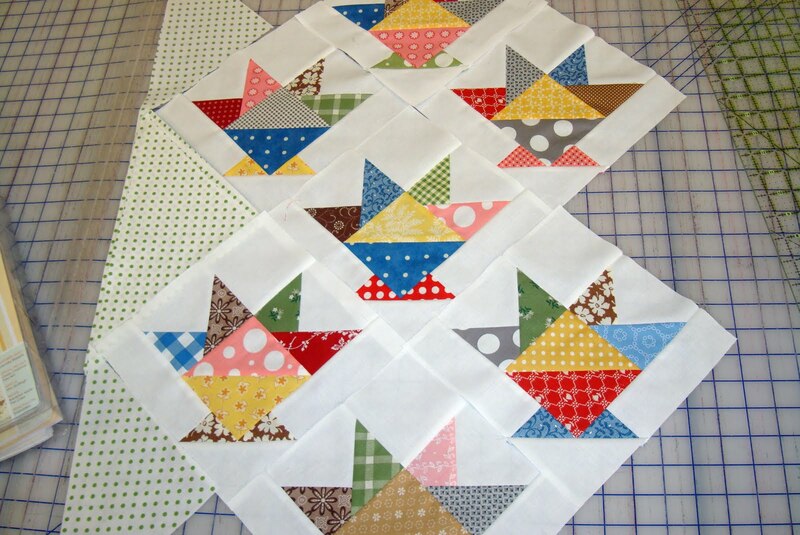 I'm auditioning center fussy cut squares so I pulled this one down to muse over. Another novelty fabric I found, but not in a fat quarter shape. 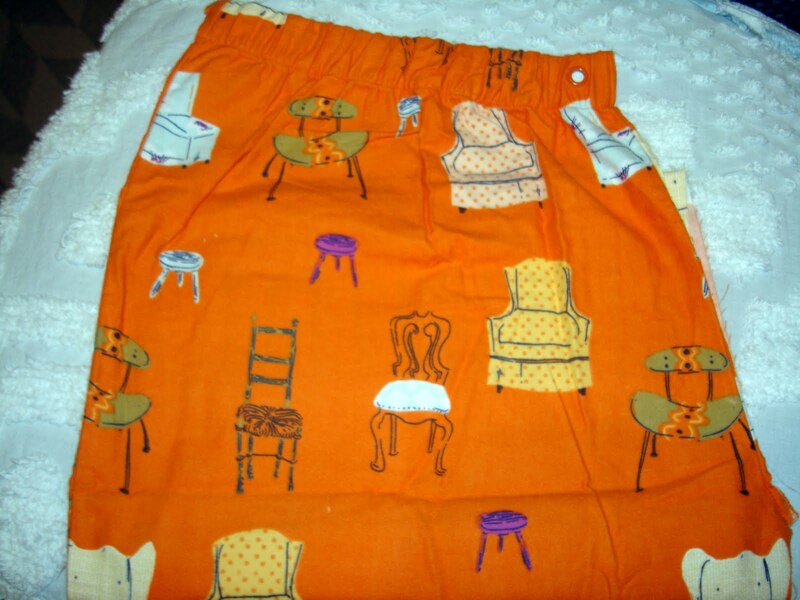 This Heather Ross in chairs used to be flannel pajama bottoms. Now it is an inspiration piece for me. I will cut off the waist band before using, however. This is a cut from a piece Shelbie bought a while ago. It is some crazy Japanese fairy tale fabric. Shelbie sent me the story that goes along with it but it was so far out I didn't think it would be a bedtime story for Allison. 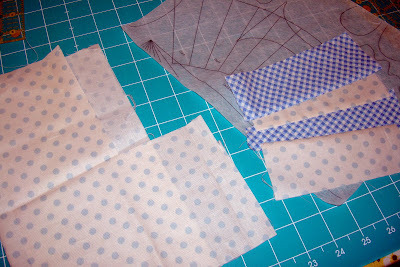 So, I thought it would be fine to cut this up for fussy cut squares, too. Not sure I will ever use the crabs, however. But the bee, tree and house are perfect. 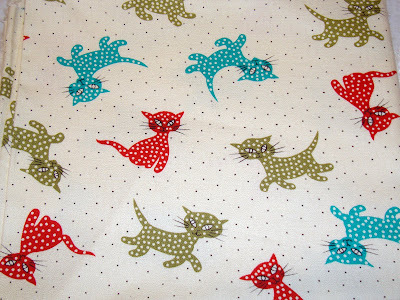 I showed this kitty fabric as a back drop for something else a bit ago. But it is so cute it deserves it's own place in FF. 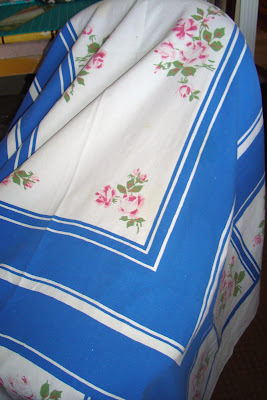 It is kind of a thinner bark cloth type. What will I ever do with it? I don't know. This last fat quarter is Red Riding Hood. Those of you that read my blog know I'm working on a RRH quilt. I haven't put it away. It is on my "works in progress" table. I am so close to finishing it. I promised myself I would have the quilt ready, quilted and bound for Alpine Days Quilt Show in early August. So I need to remember my promise and try to keep it. This fabric will help me remember. 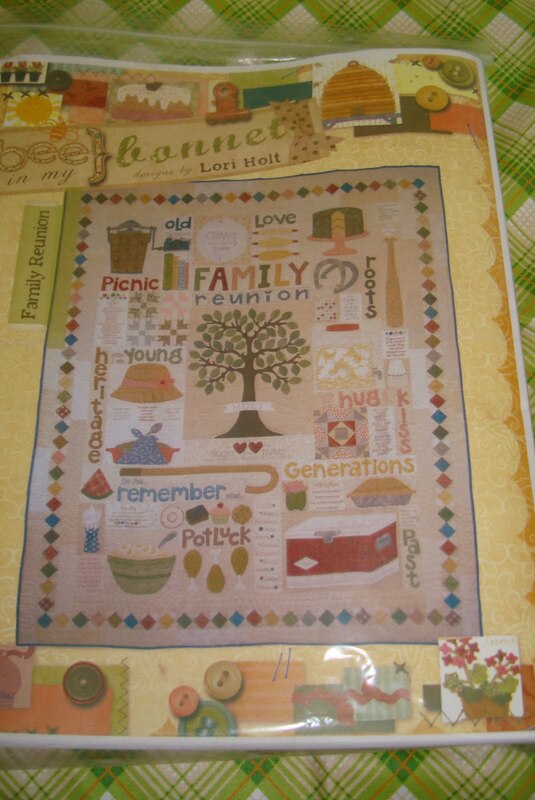 It isn't in the RRH quilt, however. But it is really sweet. Lots to do this weekend. I hope I get at least a good portion done. 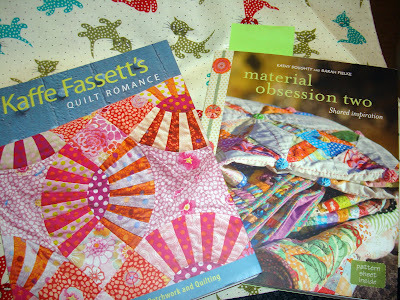 Next week's posts Alpine Quilt Group, Jelly Roll Quilt-a-Long progress, and Stash Manicure Guest Blogging. Whew. Have a nice weekend everyone. 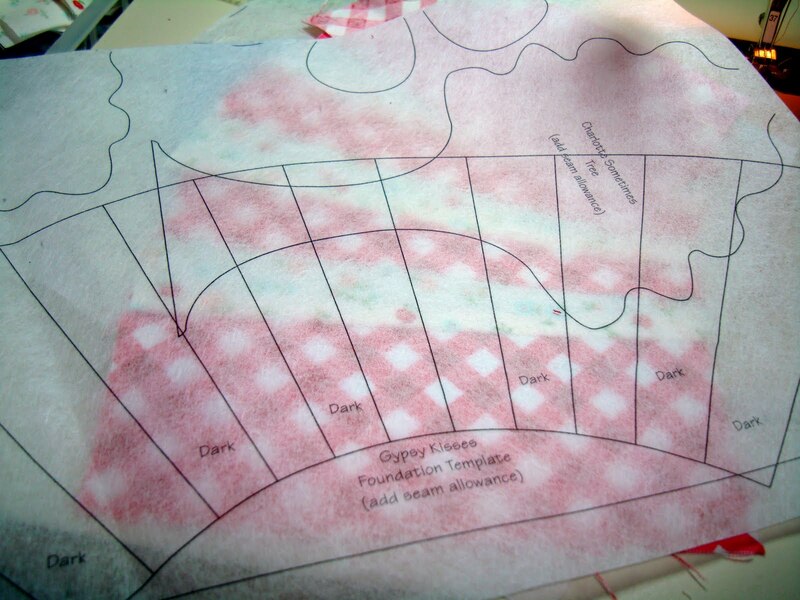 I started this "Going to Market" basket quilt at the Bryce Canyon retreat in February. I took a class taught by the wonderful Ricci and I'm so glad I did because it made it so much easier. She was a great teacher. So here is the finished, bound and hanging quilt in my entryway. 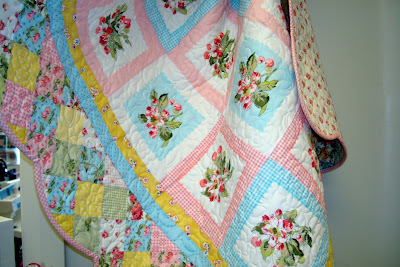 I really did enjoy making this quilt. 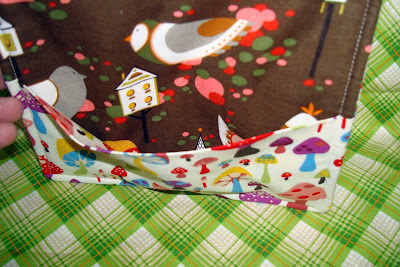 Using all the different fabrics really keeps my interest in a project. 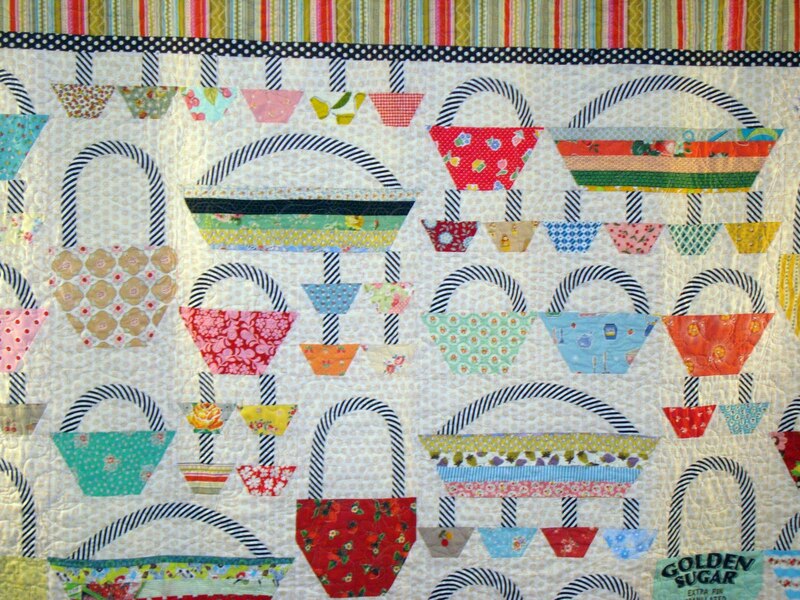 The pattern has the baskets made a tricky way and of course I ended up modifying the method to suit me. 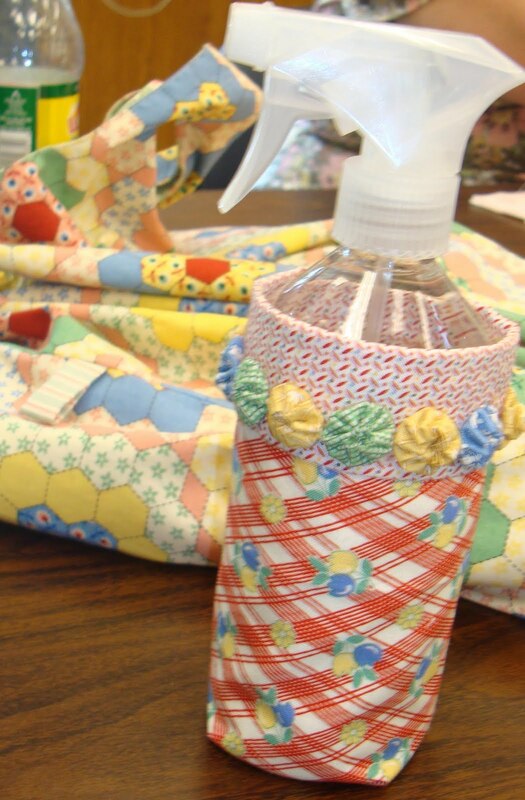 Don't we all do that with patterns? My favorite part was picking out the fabrics. 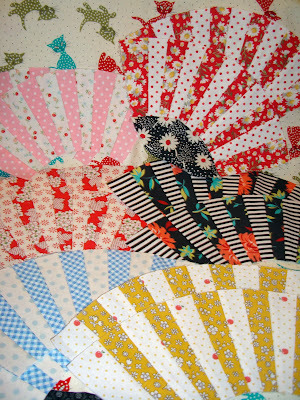 And I certainly did not end up with what I started picking out for this quilt. 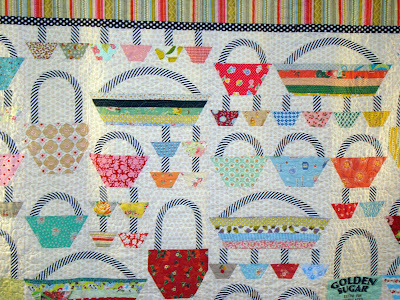 The journey is to be enjoyed though and by the time I started sewing I knew I had captured the feel for making the baskets look like a 'nanette quilt'. It is nice to have a finish. I have so many things started that I wonder how I'll ever manage to get them all done. I have some other project finishes that were mailed off yesterday to California. 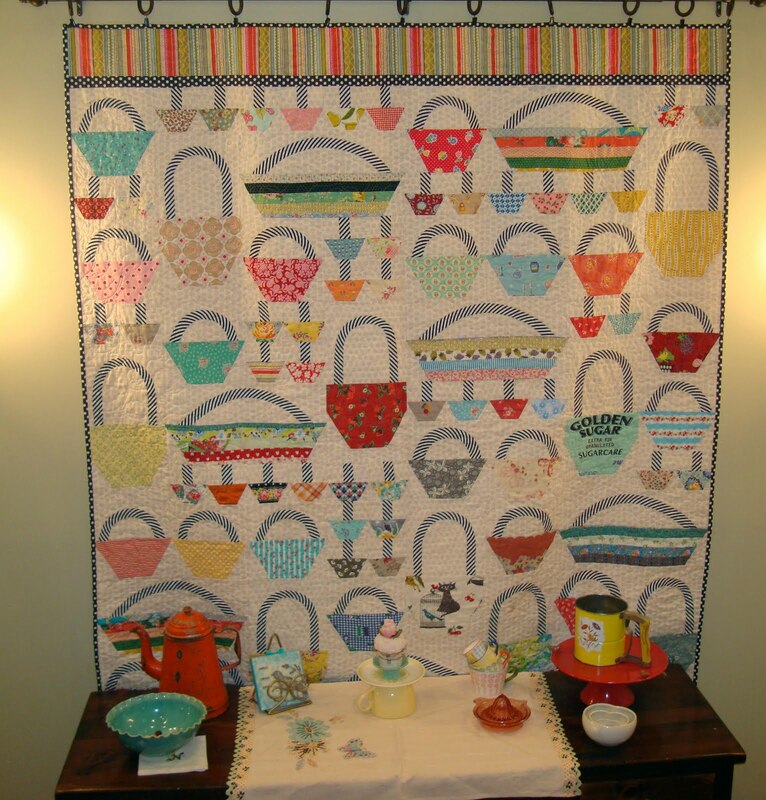 I'm hoping you girls going to Quilt Market next month will take lots of pictures of my projects at the RJR booth and send them to me. 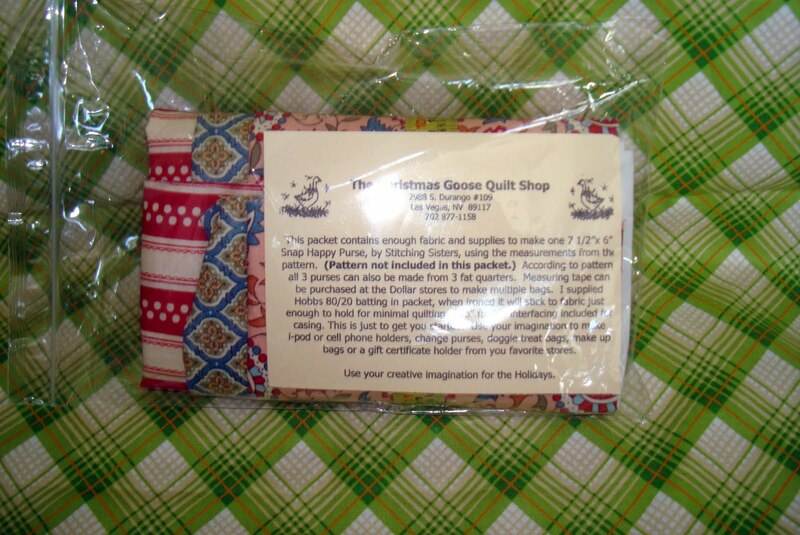 It will be my first time having a quilt (and other goodies) at Market! Now I've got to catch up on the Jelly Roll Quilt-A-Long. I'm 2 blocks behind and I'm just putting the finishing touches on the instructions for my block that will be featured in May so off I go now to work on it. It is late and I'm posting this for Monday so I hope it comes out okay. 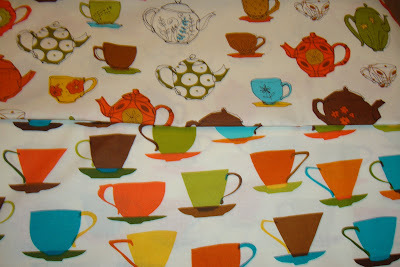 It has been another crazy busy weekend with more sewing for market (some re-dos). But so much got done so I feel happy about it. My girls and I even cooked an East Indian meal Sunday, and it turned out great. I did want to talk some more about my current new project (yipes, I haven't kept my New Years resolution at all) the Gypsy Kisses quilt, otherwise known as Pickle Dish. I have both these books. 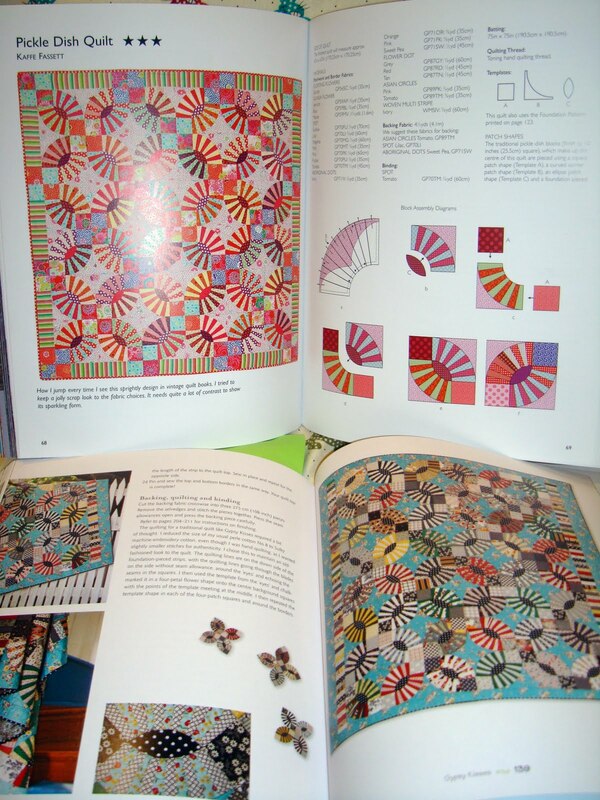 Each book has a pattern for this quilt with some slight variations and I thought I would contrast compare the patterns. When I went to have Nedra teach me this paper piecing quilt I thought I'd make the Gypsy Kisses version by Material Obsession. 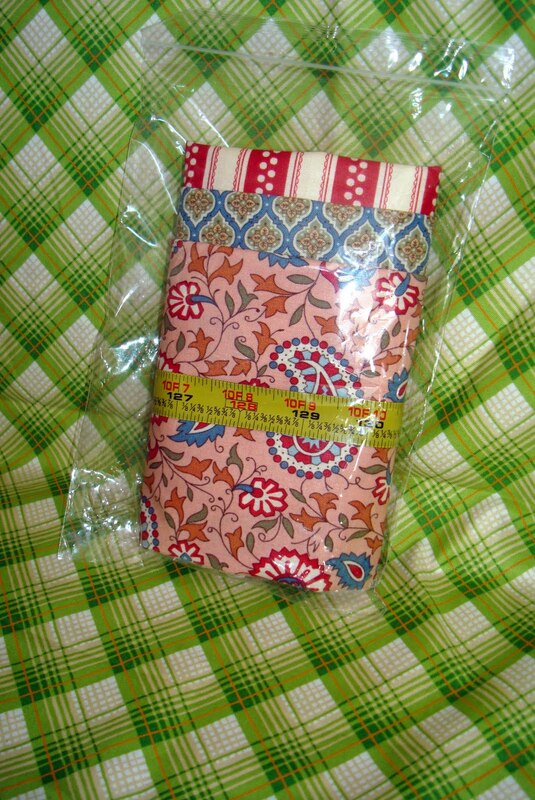 Nedra opted to make the Pickle Dish version by Kaffe Fassett. We noticed some differences and I thought I would pass them along. 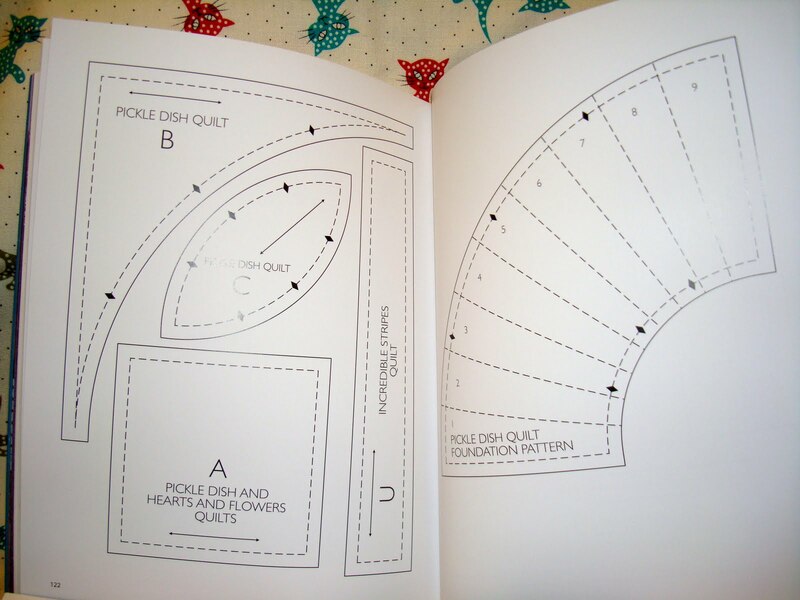 This is the pattern pull out for tracing pieces in Material Obsession's book. Note: you have to add your own seam allowances for this pattern. Which I did for the oval piece above left. The fan itself top of the photo right, I didn't add seam allowances before printing off my paper piecing guides (see below). 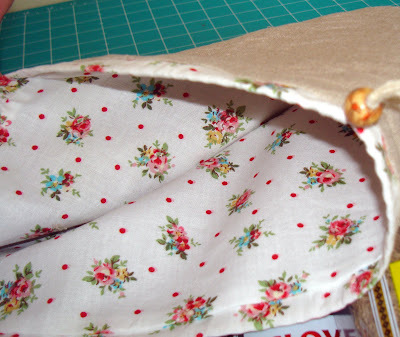 No seam allowances. But after photo copying the pattern on the paper I bought at Joann's, I didn't want to start completely over and I made my copies before going to Nedra's for instructions. So after allowing extra for the seam amount when stitching my lines, I just used my ruler to add the seam allowance before trimming each block. It hasn't been a hassle and just added under a minute to each block. 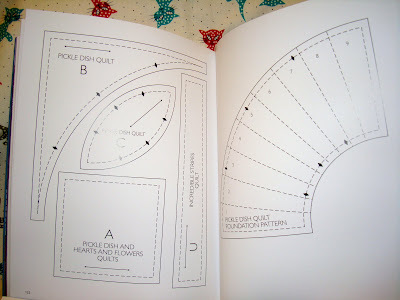 This is the foundation pattern in the Kaffe book. 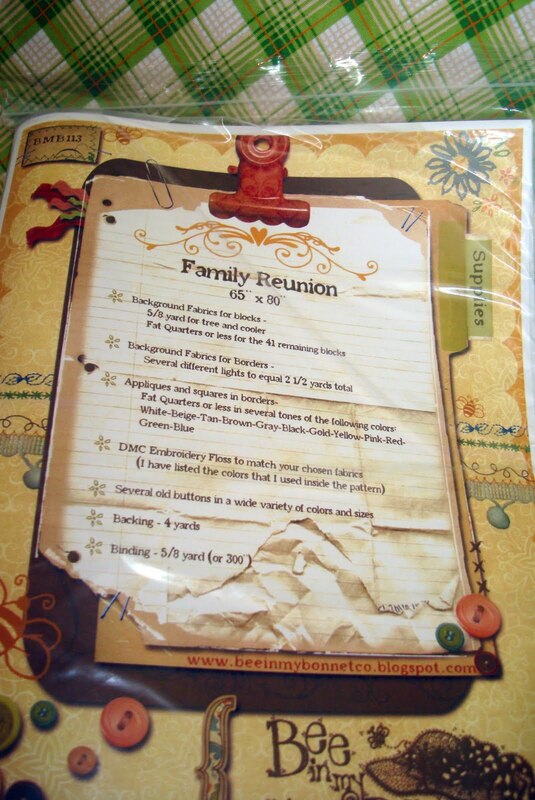 Notice he has given seam allowances and little notches for matching up the oval that joins the 2 fan pieces together. Smart! 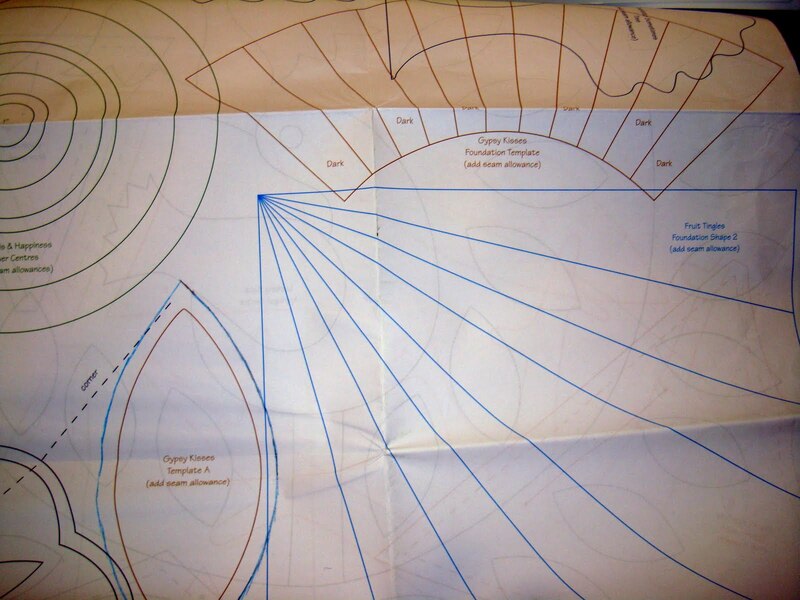 Now the reason I didn't use Kaffe's pattern is arc is a much tighter fit in Kaffe's pattern. 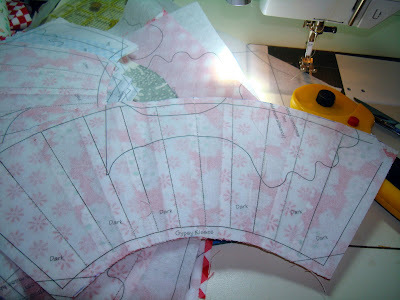 In the Material Obsession pattern, the curve is more gentle and easier to sew (for me, at least). 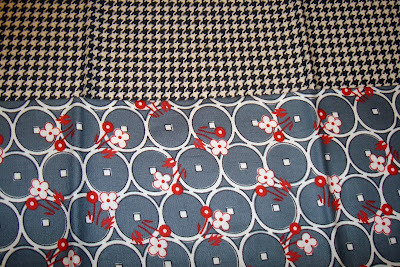 Both patterns are pretty much the same outcome but a little different in construction. So it depends on which issue you'd prefer. 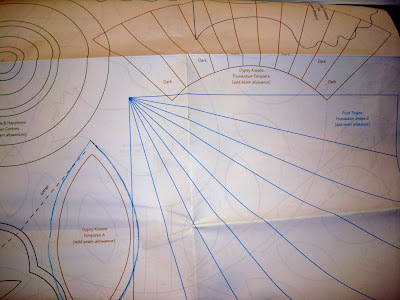 However, drawing in the seam allowances to start with would be a better solution for anyone with the Material Obsession pattern. I love this quilt! 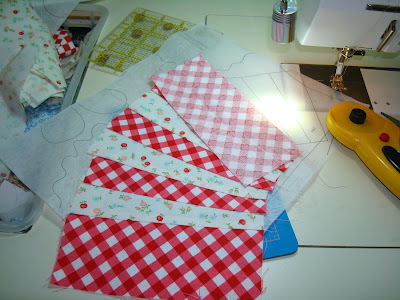 I grumble about paper piecing and how it isn't my favorite method. And it really isn't. 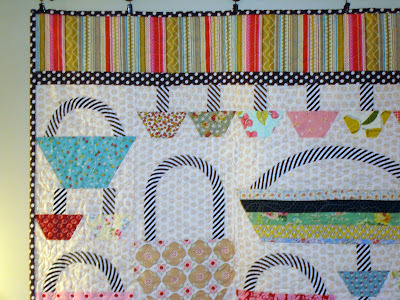 But the fabulous Janet reminded me that it is simply because of the foundation method that I am able to make this quilt at all! Can you imagine trying to cut each piece and be accurate enough with the shapes to make this work any other way? Totally impossible! 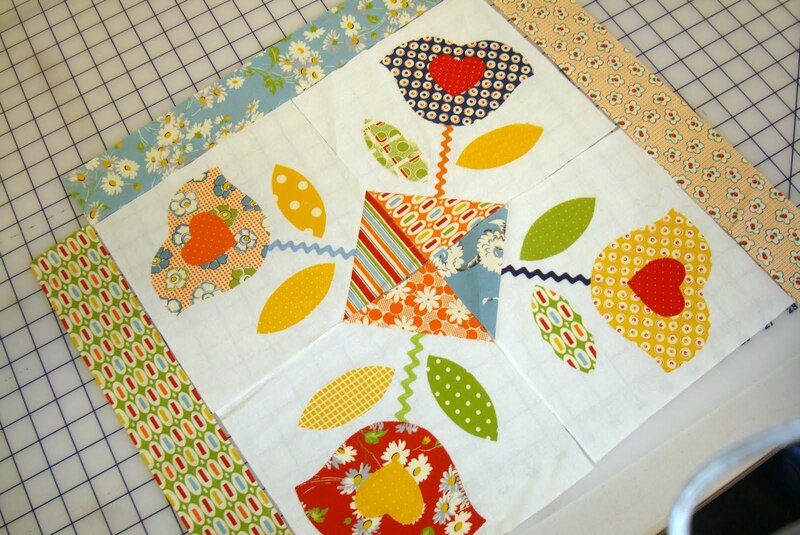 So I'm grateful for my foundation paper and for Nedra helping me start this quilt. 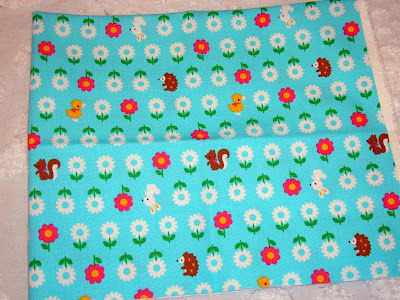 I think I have the hang of it now and making the blocks one a day (well most days) was good advice from Lori. See how much I learn from my friends! Thank you thank you. Allison was so good last week. She slept over Thursday and Friday night and slept from 9:30 to 5:00! Pretty darn good for 6 months old. She was so good for us but it is really easy to take care of her with all the help we have at our house. Everyone pitches in and it is a joy to have a baby around. Happy Fabric Friday. 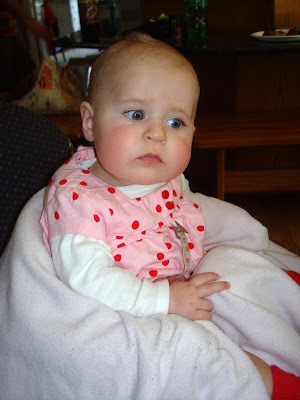 I'm posting ahead today, which I do most of the time anyway, but this time it is because last night would have been our first over-nighter for Allison at Nanny's house. I hope it went well. (Gosh that sounds over complicated but right now in real time it is Thursday.) Shelbie and I might be very sleepy today (meaning Friday). Whew. My DVR broke this week, which isn't a big deal because they just send a new one no charge, but there goes all my saved old movies. And while I was playing in St. George last week it was warm at home and every living thing in my yard came alive and sprouted buds and blossoms, including weeds. Spring is in bloom here from 0 to 60 all while I was gone. 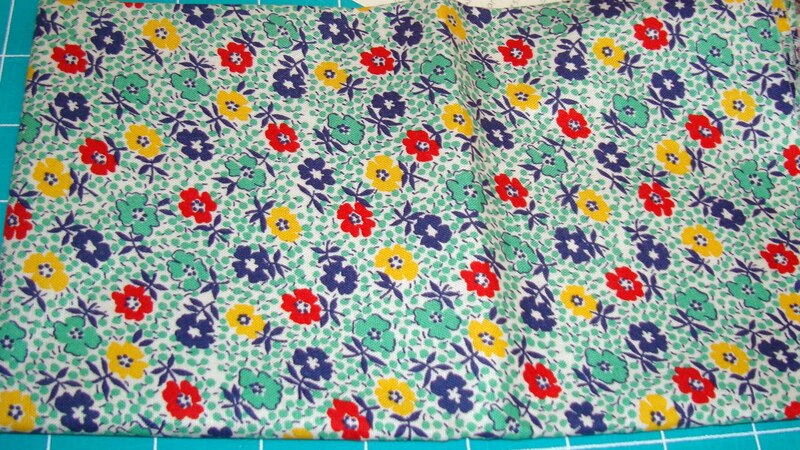 Now for fabric. 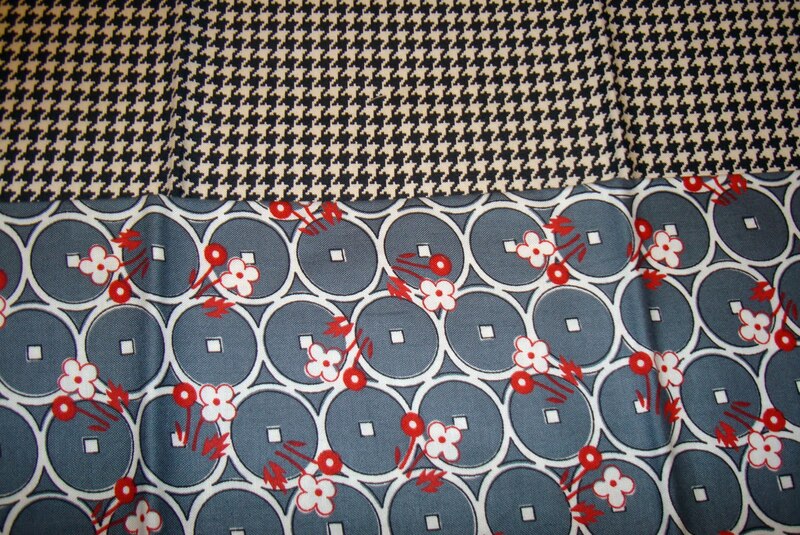 Isn't this Robert Kaufman fabric terrific. 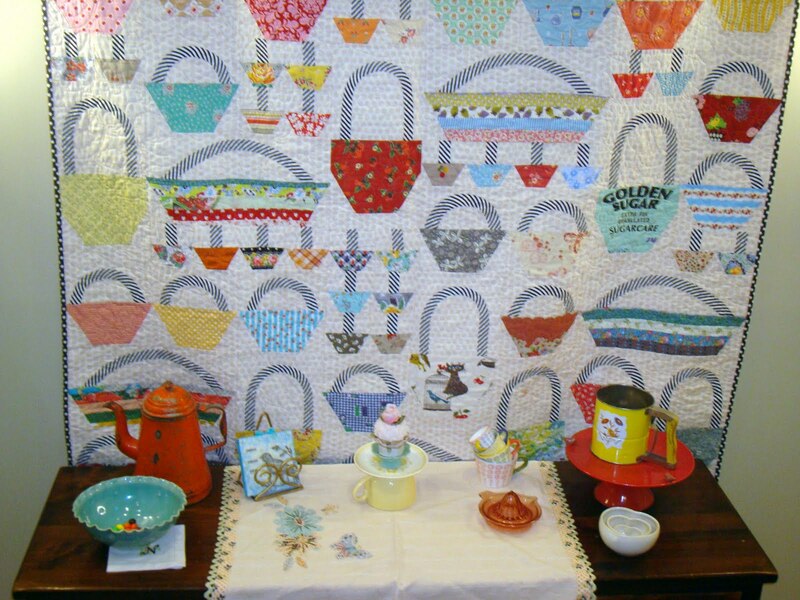 Look at those teapots and teacups, wow! So 70s. I sorta wish the colors would go better with red but I love them anyway. 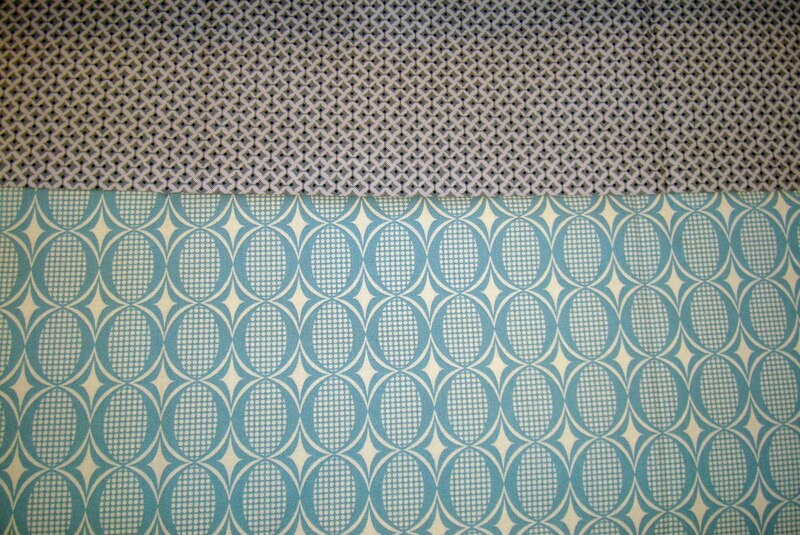 I'm pulling grays and some gray blues for the pickle dish/gypsy kisses quilt. I want the blocks in the corners to be gray. These are from Sew Mama Sew. I really love these 2. I figure the black and white look gray if you squint your eyes a bit. Well maybe not, but I'm using it anyway. Speaking of the pickle dish quilt. 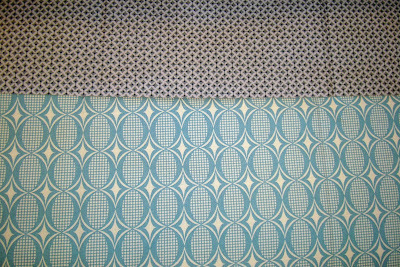 I nearly ran out of this blue and white scrap piece for this unfinished block above. 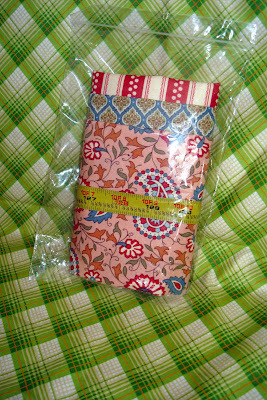 But I searched and searched in my small pieces to find just barely enough fabric to complete the block. I nearly had to beg for everyone to look in their stash for me as a back up because this dot is years old and I can't get anymore (trust me I tried). But I'm just barely okay. 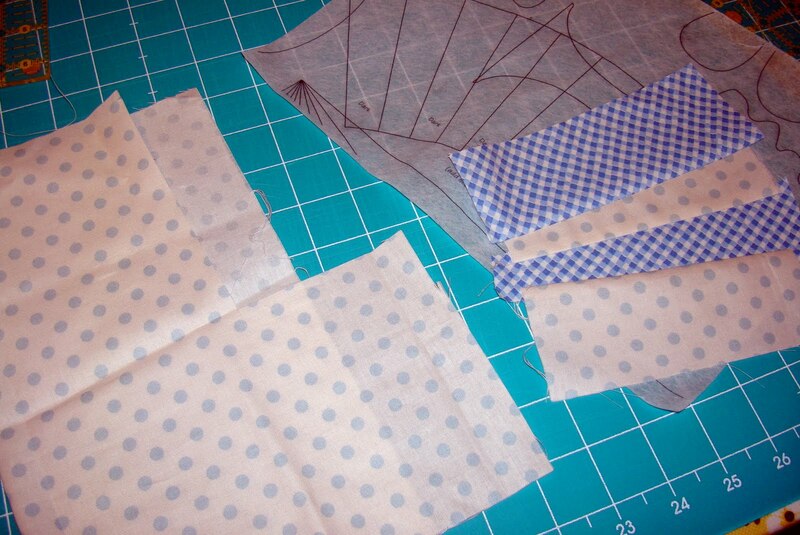 I hate that paper piecing uses more fabric than you think it will. I've been trying to make 1 block a day and so far it is working out. But not only does paper piecing take more fabric, it takes time, too. At least I think so. I got this hounds tooth fat quarter set at Superbuzzy. I've always loved hounds tooth. 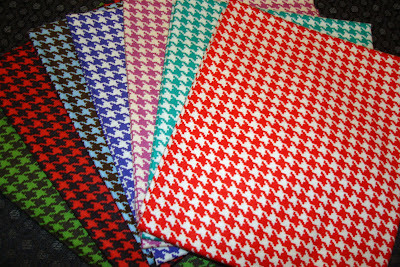 These are cotton quilting weight, which are hard to find in hounds tooth. I remember the black and white wool hounds tooth from the 60s my mom had on her shelf. I think my sister got a dress out of it. 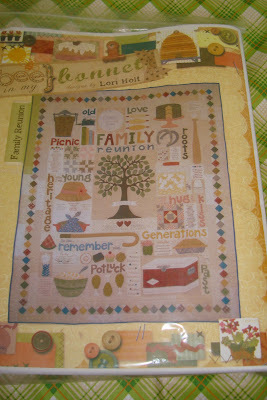 Lori, who makes the world a more beautiful place, gave me her latest pattern. Which I love. I think my favorite is the tree. It looks like the tree of life. It is fabulous. As is Lori. Rae Ann, who has more energy and drive than you would believe, gave me this kit to make a pinch bag. I think that is what it is called. I've always wanted to make one. Thanks Rae Ann. 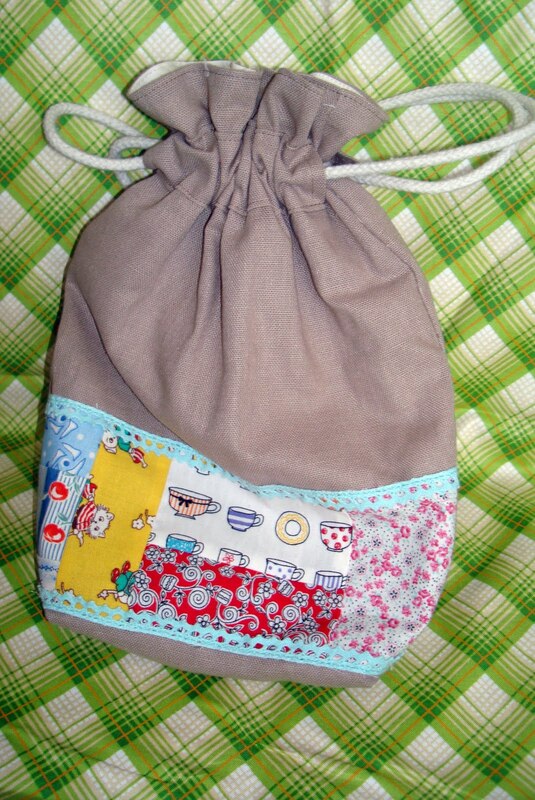 Dawn, who is kind and supportive of everyone, made the adorable cinch bag. Isn't it cute. Gotta love those fabrics and I really love linen, too. 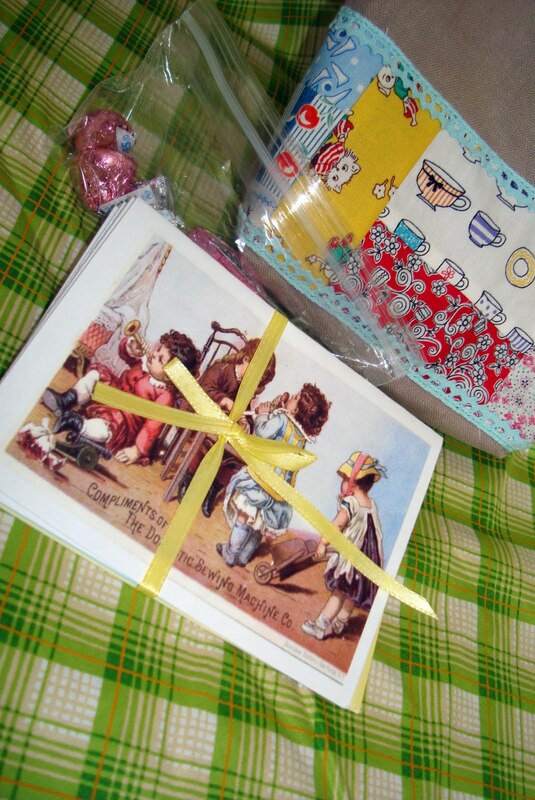 And inside it had more little gifts. Candy and cards - sweet. Thanks Dawn. I love them all. The popular and talented Sherri made me a mushroom hot pad. 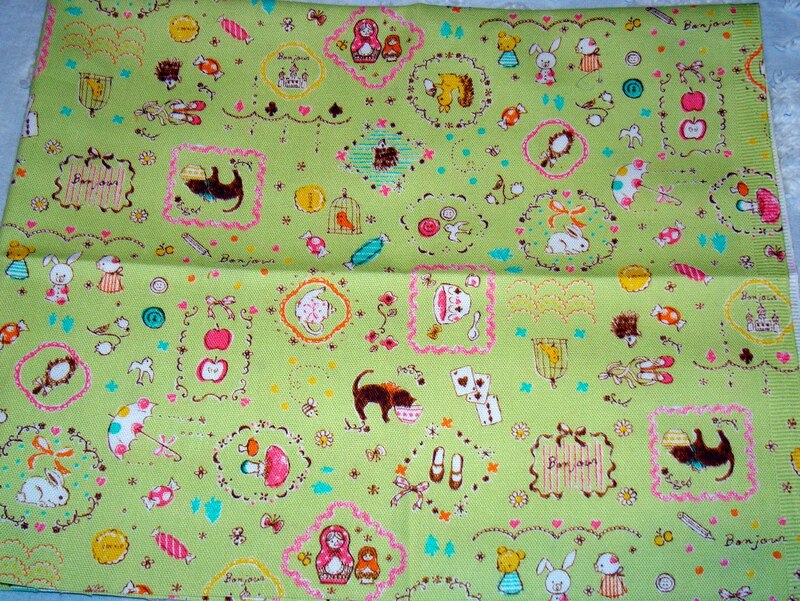 And now I want this fabric. Isn't it so darling. It has a little pocket in front. The birds and birdhouse fabric is also some I want now. See what you've done Sherri. Thanks so much. It really is so cute. 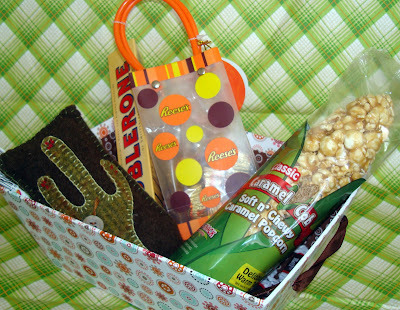 Nedra, the hostess of our little group, gave me a treat box to snack on during the event. Of course it was so cute, too. And inside . 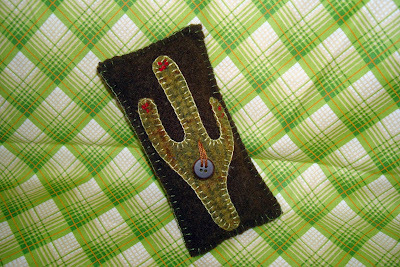 . .
was this wool pincushion. It is a cactus, of course. To help us remember our few days in the sunny south of Utah. I'll always think of Nedra when I use it. Thanks Nedra. 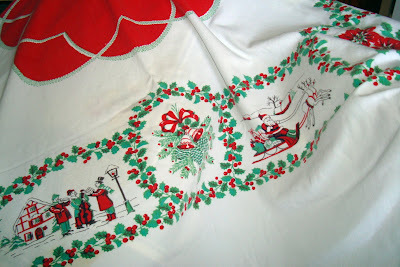 My sister Michelle brought me this great vintage tablecloth. She knows what I love. And she gave me this one, too. She thought I might cut them up and make things with them but I'm not sure I want to do that. They are in such great shape. I may just keep them to use. Thanks Michelle, that is so thoughtful of you. I know. You all hate me at this point for getting such great loot. But it didn't end there. When I got home I had a surprise package. It was full of wonderfulness inside this lovely linen bag. 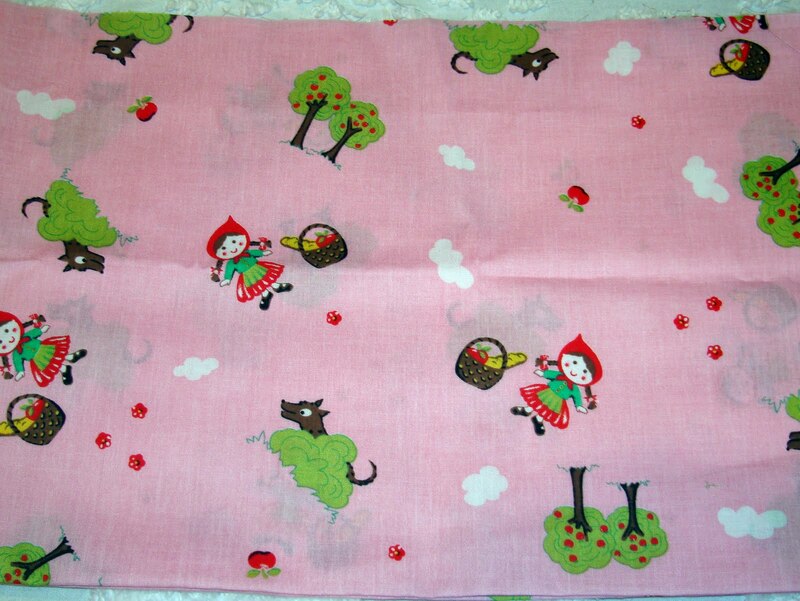 Isn't that rose bouquet fabric perfect. 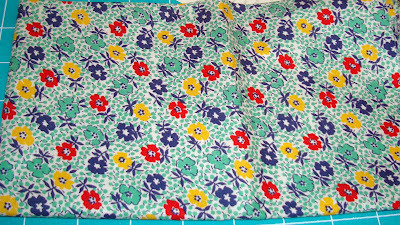 Rose fabric is one of my very favorites. So vintage. One of the lovely surprises in the box was this nifty fat quarter. With my favorite colors on it. So sweet. Thank for all of it, my friend. You are so thoughtful and good to me. Thanks to all my girls. I'm so incredibly spoiled! 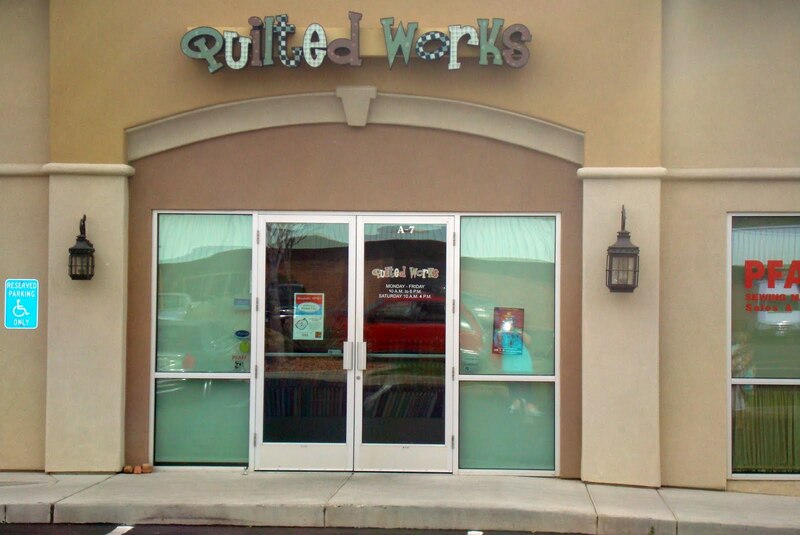 If you are ever in southern Utah you have to stop at Quilted Works. 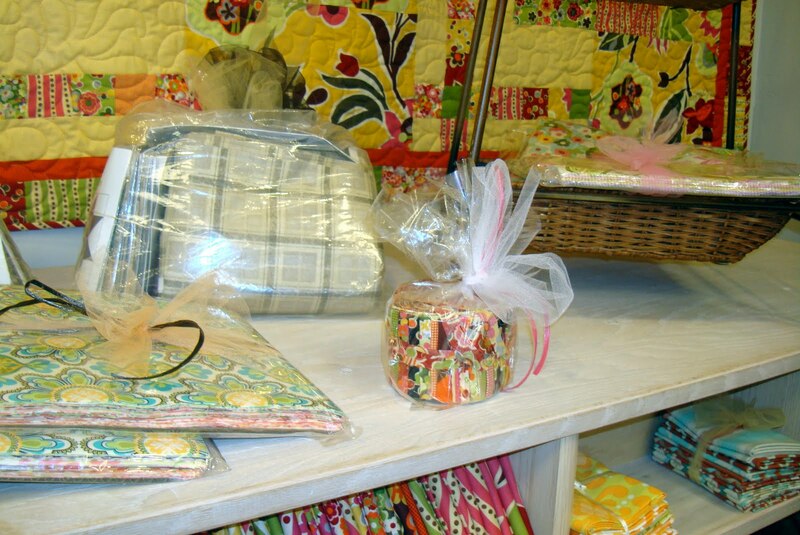 It is centrally located in St. George and it is a really wonderful shop. We were lucky enough to have them open their doors to our little group of girls last Friday -all day long! The room we were in was perfect for us to sew, visit and have lunch together in. The whole store is dressed up wonderfully. 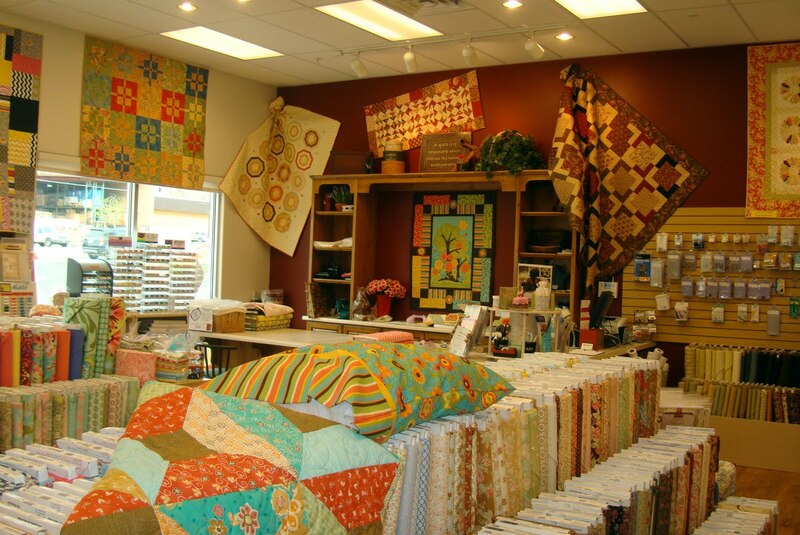 The ceilings are tall enough for lots of display quilts and they have a great selection of fabric, notions and goodies. This little quilt caught my eye . It is really sweet. I could have browsed for hours. We met the owner, manager and lots of the girls (Hi Cathy) that work at Quilted Works. They really made us feel at home. This is just a few of us having fun working together on Lori's "Eat Cake" project. You can see Sherri in green, Dawn's back in red, Rae Ann in white, my 2 sisters Michelle and Polly standing, and Lori at the far end of the tables. I hate to brag, but everyone should be jealous. It was so much fun. How often do you get to have fun sewing time with your best girls and sisters!? 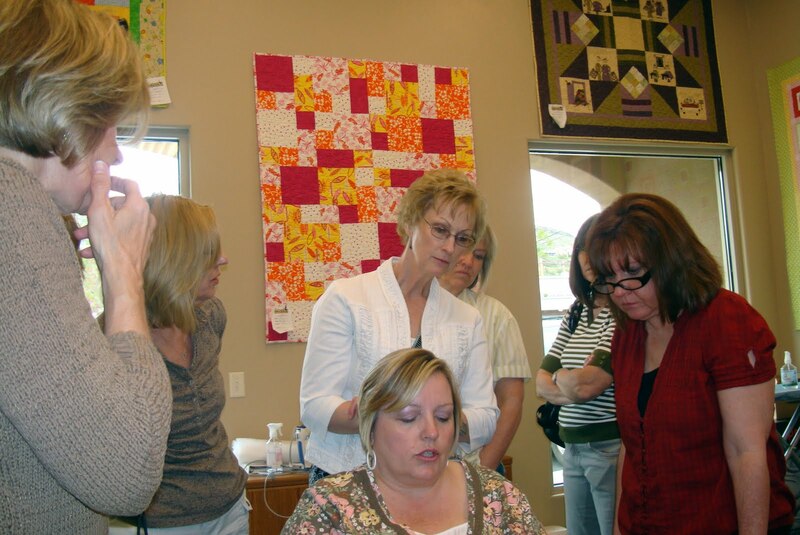 Lori gave us a class on making her fabulous applique using her layering technique. Lori is an amazing teacher. 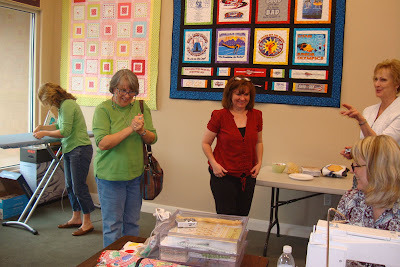 She was so gracious to take time from her own sewing to help us. Then we had a visit by a huge star! Glenna of Hollyhock Quilts (with purse). 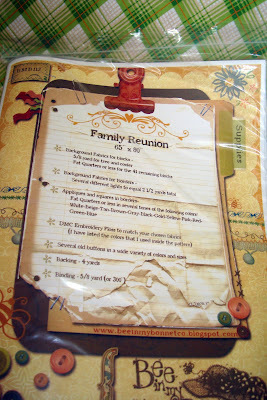 Glenna and I go back years before we had blogs. But it was the first time we met in person. I was thrilled as were all the girls. 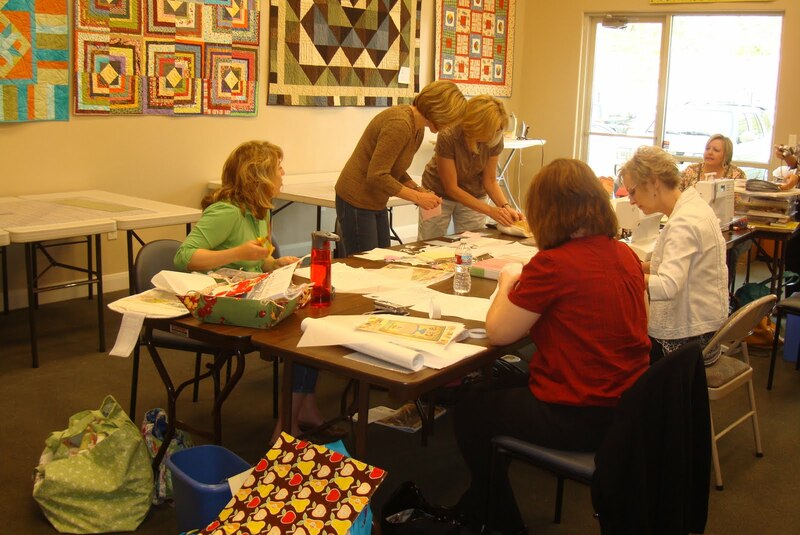 Left to right Sherri, Glenna, Dawn, Rae Ann and Nedra (seated). Words can't describe the fun time. But you can see it in the excited faces. We played a little show-n-tell. 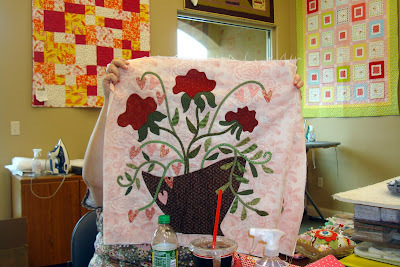 Glenna showed us her latest project. Isn't this block sweet. I love the yellow leaves. (Note to self: make yellow leaves in my next project.) Glenna is having a break from her designing but I hope to have her creating something fun for us soon. 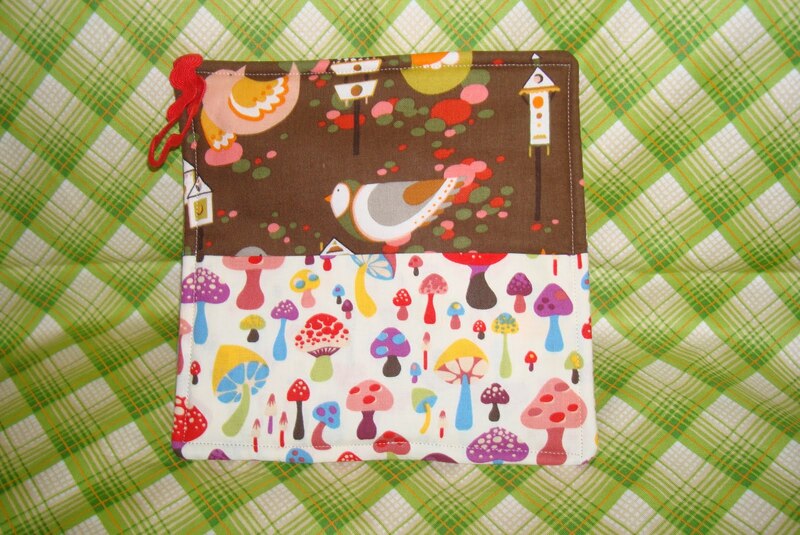 Lori brings beauty with her where ever she travels. I have to just admire everything she does. Isn't her bottle cover sweet! Lori is showing us some of her blocks here. My stems never look like that! Lori worked on these baskets while she was retreating with us. Aren't they great. Lori always says "scrappy is happy". I agree! 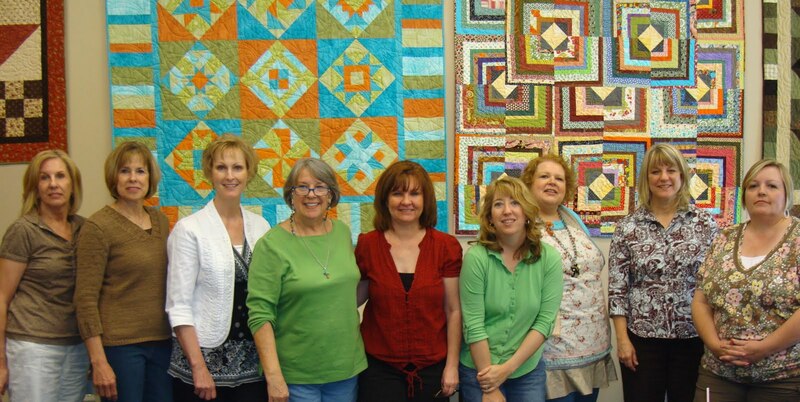 Before we left we had a moment to pose in front of the quilts on display in the classroom at Quilted Works. 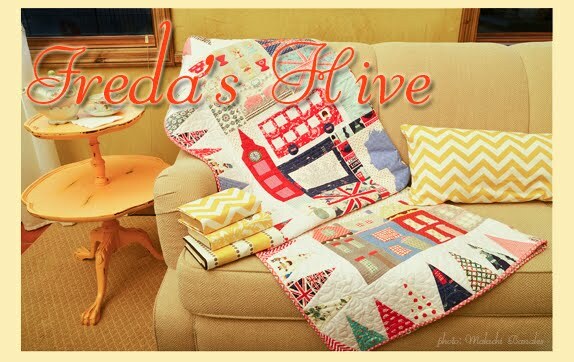 Notice Nedra's quilt on the left. Left to right: My sister Paula, sister Michelle, Rae Ann, Glenna, Dawn, Sherri, me, Nedra and Lori. I love them all. And the prize goes to . . .